Tilt turn windows prices range from $275 to $950 fully installed. 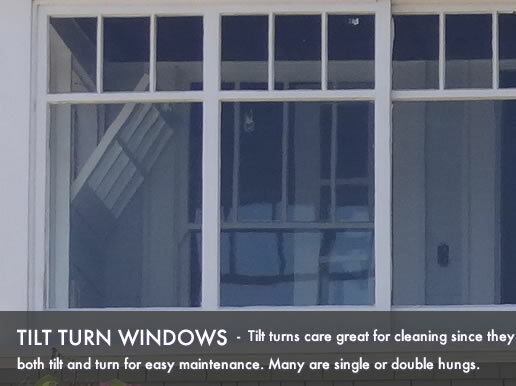 Tilt turns are typically double hung windows with the added benefit to being able to both tilt or turn for easier cleaning and more options for ventilation. They are considered a slightly higher end window, perhaps comparable to a casement window. Entry level options will use a vinyl frame with a basic glass package (either class or a low grade low-e), a basic frame without foam fill and less chambers in the extrusion. The windows will be less energy efficient and include a low end hardware - often times these will be available through retail and home improvement stores. The mid-range tilt turn options are available in a choice of frame options including aluminum, fiberglass, composite or a high end vinyl. They should include a more energy efficient glass package with a mid range low-e glass and argon fills. Typically they will include a better quality hardware and more color and finish options for the extrusion itself. High end tilt turn options are typically made by manufacturers such as Pella, Marvin and Andersen and will be a wood clad, fiberglass or aluminum frame with a high end glass package. They should offer highly energy efficient numbers and well made hardware and upgrades. Installation for these windows can range anywhere from $75 to $250 per window. The price is determined by the amount of work required to install the window. For example, if the contractor needs to reinforce the frame and carry out any trim work you can pay between $150 and $250 per window. The price is also determined by the number of windows being installed - the more windows the lower the price will be. Our window replacement cost estimator can provide great price quotes for your next project. Low end windows costs on tilt turns start at $275 and top out at $500 fully installed. Average windows costs on tilt turns start at $500 and top out at $750 fully installed. High end windows costs on tilt turn\s start at $750 and top out at $1,000 fully installed.